Salesforce undoubtedly is among the world’s top leading CRM cloud technology that has a huge market globally. Salesforce as a domain is expanding in terms of its application in Customer Relationship Management to Mobile Marketing. Considering the dynamic advancements, frequent effectual innovations and perpetual updations in Salesforce and its consequential growing popularity among Fortune 500 companies, top MNCs and start-ups, it is predicted that the Salesforce ecosystem will create more than 1 million new job opportunities by 2020. The demand for capable, qualified Salesforce-skilled professionals is unlikely to waver off its upward trajectory. Salesforce has transformed the concept of CRM globally and so if you practically know how to harness the maximum potential of this technology, then you are on your way to become indispensible for any leading organisation. You calibre and experience at solving the most pressing CRM needs that any business requires, will definitely help you get recruited with a reputed enterprise. This way you can certainly kickstart an exciting career and broaden your scope for success with multiple professional growth opportunities along with stunning salary packages that will be worth your effort. This makes it pertinent to get yourself appropriately skilled in Salesforce, get hands-on experience through working on real-time projects and thus be job ready. You need to improve you credentials by clearing at least one (or more if possible) certifications. There are some very notable and authentic platforms that can help you in this process and give you excellent training for being skilled as well as certified in different aspects of Salesforce. 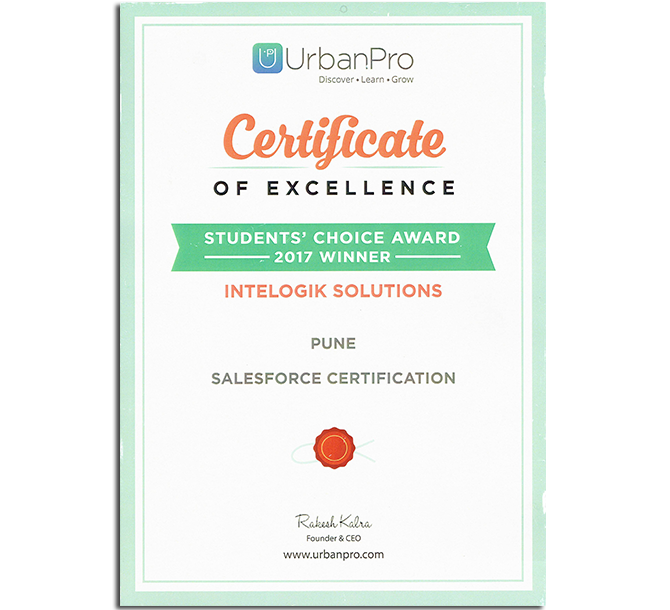 Intelogik be a reputed Salesforce training institute offer well-structured online training programs in Salesforce. The virtual e-training courses and certification-guidance courses – which are self-paced or instructor-led- help you attain proficiency in the Salesforce platform and make you optimize its usage and efficiency. A comprehensive, hands-on knowledge in Salesforce system will enable you to find quick solutions for automating sales and related functions, sales forecasting, product knowledge and order management. With an expertise in the world’s top CRM platform, you tend to increase contacts, sales revenue every day and attain optimal business targets with much ease. The best part is, even if you hail from a non-technical background and have absolutely no knowledge about coding or programming, you can still take up training in Salesforce and seek an easy entry into non-technical type Salesforce jobs. With limited technical knowledge and basic training in Salesforce you can don the roles of Sales Professionals, Marketing managers, User Experience Designers, Human Resource Managers, and Content Creators. These job profiles can fetch you salary packages of over $70,000 per annum. Once you have fair amount of experience in any one of these profiles you can even attempt to master technical knowledge through certification courses in Developer, Admin, App Builder etc., and take your career graph further high up. As a student or a novice trained in Salesforce, you can initially work as a freelancer Salesforce expert or give your services to non-profit organisations for value-added experience that will build up your resume and help you get recruited with reputed companies after a certain amount of work experience. It is of much relevance to get trained in Salesforce courses by institutes or platforms that also assist you in placements. Intelogik platforms offer 100% assurance for placement services after completion of training courses. They prepare you for job interviews and help you get placed with top notch MNCs that offer handsome pay packages and satisfying work profile. Once you are trained in Salesforce it’s highly recommended that you take up a certification course and pass the certification exam for attaining a flourishing career in Salesforce. The training courses related to Salesforce certification are meant to provide you hands on experience and enhance your analytical skills. They make you do lots of industry-relevant live projects, case studies based on real life situations and scenarios-with which you’ll learn a lot practically. The platforms devote averagely about 12 hour training for live projects and 20 hours in class lab practice in Salesforce certification courses. Salesforce certified professionals are in very high demand by all organisations. A Salesforce certification validates your expertise and showcases your commitment towards this domain. When you go for an interview armed with Salesforce certification, you are likely to ace it in one go. Professionals certified in Salesforce possess efficient processing abilities, evolve innovative application strategies, give best response timings to customers, are very proficient in handling challenging business situations with complacency and bring profits to their companies. This makes them indispensible assets for their organisations. No wonder this is what that makes them fetch salaries as high as $100,000 per annum! GET your FREE DEMO now ! Why Salesforce certification is essential?